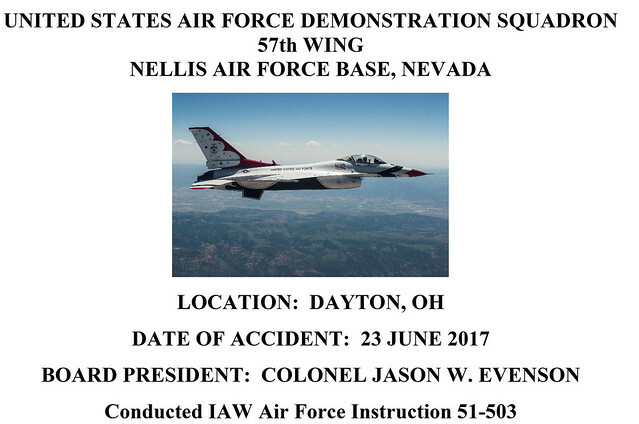 ​A USAF Thunderbird F-16 was destroyed while landing in June in Dayton, Ohio, because the pilot touched down going too quickly for the rainy conditions, an Air Combat Command investigation found. On June 23, an F-16D, tail number 91-0466, from the Air Force’s Air Demonstration Squadron of the 57th Wing at Nellis AFB, Nev., was flying a “familiarization sortie” at James M. Cox Dayton International Airport with a member of the team’s crew in the back seat. The weather that day included broken clouds at about 900 feet and overcast at 2,500 feet, with gusty winds and heavy rain. The pilot’s first approach to land was missed because the pilot couldn’t see the runway environment due to standing water on the canopy. After flying a holding pattern for about 40 minutes, the pilot proceeded to land, on instruments. During this approach, the pilot again experienced standing water on the heads-up display. The pilot considered the crosswinds at the airport and decided to fly a faster approach of 160-165 knots. The aircraft’s data recorder, however, showed the F-16 crossed the runway approach end threshold at 193 knots. which “significantly increased the distance required to land” the F-16, according to the ACC Accident Investigation Board report released Friday. The F-16 touched down about 4,764 feet down the wet runway at a speed of 25 knots above computed touchdown speed, leaving 6,137 feet of prepared surface left. The pilot was unable to stop and entered the overrun at 50 knots, overturning in the grass. The pilot made no attempt to eject, and was stuck in the aircraft as rescuers were forced to cut through the canopy to get the pilot. The pilot sustained several injuries and was taken to a nearby hospital. The crew member in the back seat was not injured. The F-16 was destroyed in the mishap, at a total loss of $29.2 million. While the AIB president found the main cause of the crash was the pilot landing with excess airspeed, the board also found other contributions to the mishap were environmental conditions affecting the pilot’s vision, a misperception of the changing environment, and the pilot not following procedure for braking on a wet runway.